A tale of two Cities – Could London Learn from Brisbane? As was the case for the period of which Dickens wrote, these too are turbulent times. Bands of Treasurlutionaries are roaming the corridors of power, at the behest of Citizen George Osbierre, the Chancellor of the Grand Coalition, looking for programmes to cut, costs to reduce and heads to metaphorically roll. Cries of “Economé, Insolvencé, Redundancé”, ring out in the plush carpeted corridors of Quasi Autonomous Government Agencies across the land. We stand and watch, as first, Commissioners, of both the Infrastructure Planning and Audit varieties, and then Agents, Regional Development for the advancement of, are dragged out to take their place in the tumbrel, to await as, another eminent Victorian, William Schwenk Gilbert so lyrically put it, “the sensation of a short sharp shock from a cheap and chippy chopper on a big, black block.” At which point we will stand, watch and presumably knit. Whilst the new Government has reached its first 100 days, other electoral cycles are ticking. Candidates to oppose the current Mayor in 2012 are in mid hust and before long the Mayor himself will have to manifest himself amongst the electorate. Integral to success in this election will, we hope, be a meaty agenda of transport infrastructure capacity improvements that will drive through to resultant agglomeration effects on the economy of London. The problem is that chunky schemes tend to be both expensive and disruptive and at a time when money is tight and the existing infrastructure is looking distinctly crumbly at the edges, the scope for capturing the imagination of Londoners is somewhat restricted. Thinking outside the box, it appears, may need to be the order of the day. There are three lines of approach here that could offer a rich domain for ideas. The first is to ask the question: “Who else is having this problem and how are they solving it?” The second is to examine key elements of what could be the ideal solution. The third is to visit the attics where old ideas are stored – often bright ideas occur to people but never get beyond being a twinkle in the imagination because the time was not then ripe. Such ideas have often attracted the discouraging put down, “It’s a good idea but (insert excuse here)”. Rembrandts in the Attic – Out of the box thinking. For those of an ecological bent, the reports produced by the many and various Think Tanks make really good insulation. Most Think Tank output gets skim read once and then filed on a bookshelf before demotion to the attic, but not all of it deserves this fate. 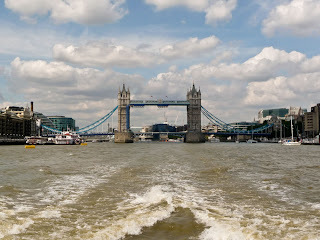 Our thanks and Copyright acknowledgements to Sue Ward for this picture of Tower Bridge taken from a Thames Clipper. Edited by Robert McIlveen & Ben Caldecott, the report is a team effort with chapters written by Paul Buchanan, Andrew Gilligan, Zac Goldsmith, Cynthia Grant, Steve Norris and Neil O’Brien. It is a model of clarity, analysis and self effacing titling. Whilst it does what it says on the tin in terms of suggested service patterns etc., the real strength of this publication is that it asks and answers the question; how can significant new capacity be injected into the centre of London’s transport infrastructure? The Thames is seen as a means to this end. The river promises an exciting new transport network for Londoners, at a fraction of the normal cost for infrastructure projects, but needs sustained political leadership to make it happen… we can make much more of the river for very little cost, producing a new, integrated and expanded service which will offer a great new option for many of London’s commuters. The river is a core part of London’s identity yet it is cut off from its transport network. By upgrading and extending Central London piers, using the planning process to deliver new piers in Docklands and the Thames Gateway, and establishing air traffic control style-management of the river the infrastructure for successful river services can be established. This will enable the sort of service London deserves: ten-minute services departing from well-managed and organised piers, stretching from Putney in the West to Erith in the East via Central London and Canary Wharf. The key to making it all happen is integration with the rest of the network, which has the potential to unlock suppressed demand and make the service financially viable with little or no increase in the current small subsidy. While it would remain a premium service, bringing it within TfL’s system makes it much more attractive than when operating on a standalone basis. This report has at its heart a robust demand study to establish that this is more than just a dream: 12 million journeys a year on the river can be achieved by 2026 if our proposals are enacted, an increase of 287.1% above the projected number of journeys in 2009. The river services at present receive very little subsidy compared with other modes of transport, yet have significant benefits for people living and working near the river. The business case projects that this is commercially viable, with the right framework – integration with the rest of the network is crucial to unlocking the river’s potential. River services have the potential to add a new element to London’s transport system at very little cost. In fact, for the costs of upgrading the Central London piers, far more private than public sector investment will be leveraged in the form of new boats and outer London piers. For relatively little outlay in terms of subsidy and capital expenditure significant private investment will deliver an outstanding service. Spending £15-30 million on upgrading piers will produce absolutely first-class facilities for an expanding service, while subsidy equivalent to that enjoyed by buses and DLR would cost a maximum of £4 million per annum once the service has grown to its predicted maximum and an average of £3 million per annum over the next 17 years. By dramatically improving public transport on the River Thames our proposals would aid the regeneration of East London. Some of London’s most deprived districts would be linked with Canary Wharf and the City by a stylish, frequent and reliable service. London, rivalled only by the Docklands Light Railway (DLR). The quality of life benefits stem from the same source – the space, fresh air and, due to safety regulations, guaranteed seat (or wheelchair space) which make river services so attractive. By introducing demanding emissions standards on boats bought in the proposed expansion of services and integrating the service, river transport could become a much lower carbon form of transport than the alternatives. The river is underused by people at present. This report sets out how, with sufficient political leadership and integration, public transport on the river can flourish – as it does in Brisbane and Hamburg. Neil O’Brien then makes a compelling case for learning lessons from Brisbane. 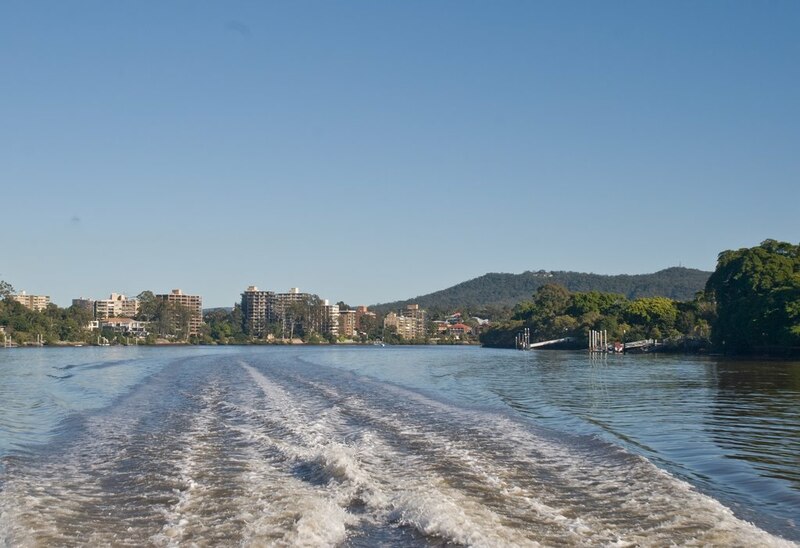 High-frequency linear river commuter services exist in many cities including Hamburg, Paris, Rome, Amsterdam, Chicago, Cairo, Dubai, Bangkok, Manila, Tokyo, and Sydney (which has a service up the Parramatta River in addition to its cross-harbour ferries). There are also high-frequency linear services on lakes or channels in Zurich, Geneva and Stockholm, among others. However, it is Brisbane which provides the clearest model. This congested city with little recent tradition of river use has established a long-distance, high-speed linear river-bus service, fully integrated into the rest of the transport network, which quickly achieved impressive passenger volumes and market share. There are many similarities between London’s Thames Clippers service and the City Cat operation in Brisbane. Both use similar catamaran-type vessels; indeed, some of the boats used by Thames Clippers were built in Brisbane. Like London, Brisbane has experienced substantial employment and population growth in recent years, placing severe strain on the transport network: the population of the municipal area grew by more than 12% between 2001 and 2007. Like London, Brisbane has a developed, electrified rail network and an extensive bus service, but also suffers severe traffic congestion. Like the Thames, the Brisbane River does not run a particularly straight course and is not the most direct route between several of the places it serves. Brisbane’s current water service began in 1996, just three years before London’s. The two cities have almost the same number of boats (Brisbane 14, London 13) and a route of similar length (Brisbane 11.8 miles, London 11.25 miles). Nevertheless Brisbane’s service has won a far greater market share than London’s. Brisbane’s population of 1 million is less than a seventh of London. 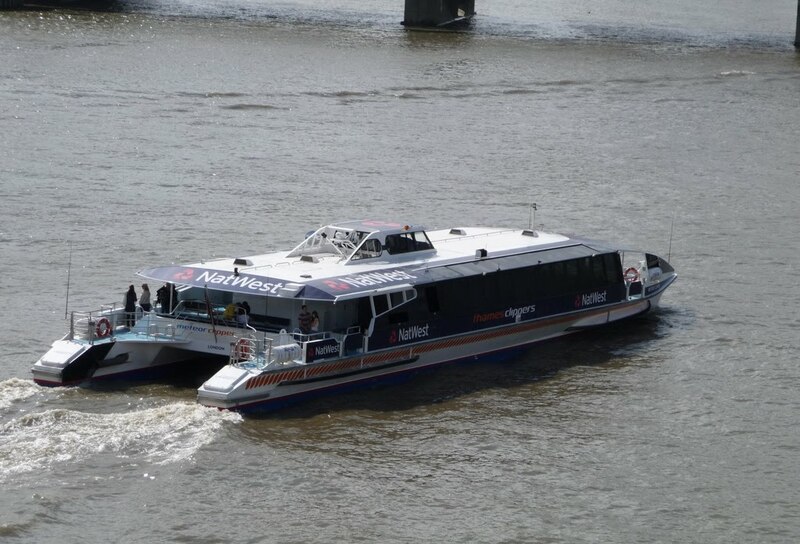 But the City Cats carried 6.1 million passengers in 2007-08, more than twice as many as the Thames Clippers service, even though the boats themselves are smaller, with a capacity of 149-162 people against most of the Clippers’ capacity of 220. If the conventional linear ferry, which is also part of Brisbane’s regular transport network and serves the city centre, is included, the total number of passengers carried was seven million – 5.1% of the total public transport market and more than a tenth of the total passenger volume on the buses. By comparison, the Thames had a share of London’s public transport market of less than 0.1% in 2007-08. Unlike London’s river bus, the Brisbane City Cat service was established from the start by the local council with a clear commitment to both capital and revenue subsidy. Brisbane City Council bought and owns the boats, which cost about A$3 million (£1.6 million) each, a total of about A$40 million (£21 million.) The council has also invested about A$10 million (£5.5 million) in piers. The service started in 1996 with four vessels, operated by a contractor, and for the first eight years its growth patterns were somewhat like London’s: very good but not amounting to a significant presence in the transport market. The turning point came in 2004 when a new contractor, Transdev TSL, took over and, most importantly, the service was fully integrated into the rest of the Brisbane transport network. From July 2004 the boats have joined local buses and rail in a common zonal fare structure. Monthly travel passes for the other modes are also valid on the water. A single ticket takes you, at no extra charge, on to a connecting bus – and 10 of the City Cat’s 15 stops have bus connections from the pier. Almost from the moment the service was integrated, passenger numbers exploded. The new contract with Transdev anticipated a 50% rise in passengers in the seven years to 2011; this was achieved in 18 months. By 2007, there were 78% more passengers than in 2004. The fares are substantially lower than London’s. The maximum single fare is A$2.90 (£1.50), or A$2.32 (£1.20) with a go card, the Brisbane equivalent of the Oyster – less than a quarter of the London fare. A monthly ticket is A$92.80 (£47.86) – less than half the London price. The service is also more frequent than on the Thames. The City Cat now runs every 15 minutes throughout the working day. At peak hours on the busiest part of the route, intervals between boats are typically seven to eight minutes and can be as little as four minutes. None of this would be possible without public subsidy, albeit a modest one. The revenue subsidy from Brisbane taxpayers is A$12 million (£6.2 million) year out of a total annual subsidy for Brisbane transport of A$273 million. Total public expenditure on the service, boats and infrastructure since it began in 1996 has amounted to around A$120 million (£61 million), an extremely low figure by the standards of London transport projects (The Woolwich DLR extension was built as part of a £150 million PFI deal). 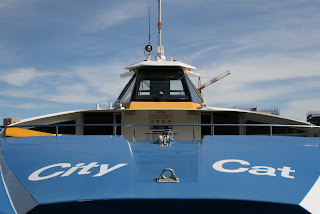 The City Cat has seized the public imagination, becoming in the words of Brisbane’s Lord Mayor, Campbell Newman; “An iconic part of the city.” …The difference between Brisbane and London is primarily a matter of political leadership and a small amount of money. Unlike in London, with its tangle of responsible bodies, leadership on the river is vested in the Brisbane City Council. The council has been prepared to subsidise the service and the establishment of fully integrated city transport has been the critical factor. Our thanks and Copyright acknowledgements to Elisha H for this picture of the City Cat Catamaran that operates in Brisbane. It is slightly smaller than the Thames Clipper variant used in London. Elisha, in giving her permission to use this photograph, was unstinting in her praise of the service and its impact on her home city. For a Think Tank that describes itself as Centre Right and enjoys the public endorsement of Boris Johnson and Iain Dale, the Policy Exchange comes up with some quite left of centre “dirigiste” ideas about how to how to improve river transport on the River Thames. It demonstrates a sound grasp of agglomeration economics in its crisp list of 13 things that must be done – something that is often lost, both corporately and politically. when the words of the moment are cost-cutting. 1. TfL must take leadership and ownership of river services – By appointing a board member to be responsible for delivering river services, and strengthening the under-resourced executive team, TfL can be positioned to take a more strategic interest in developing river services. 2. Task TfL with air traffic control-style traffic management – At present piers are congested, tourist and transport boats impede each other and there is minimal enforcement of timetables. With ownership and leadership of river service planning and procurement, TfL can manage the traffic flexibly to minimise delays and disruption, giving priority to different services over peak times throughout the day. 3. 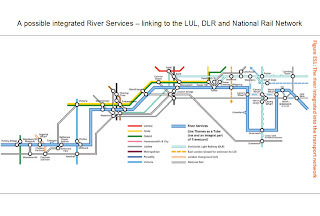 Ticket integration – By bringing the river services within TfL’s ticketing structure the river service will become to be seen as one more part of the transport network. This includes season tickets, full Oyster and Travelcards. Much better enforcement – on boats and at piers – is needed to clamp down on fare evasion. TfL – At present pier ownership is split between a variety of private and public bodies. In the core Central London area TfL should seek to buy all strategic piers in order to integrate pier ownership and traffic management; TfL should manage those key piers it cannot buy. 5. Key piers should be upgraded and extended – Some piers are in serious need of expanding or upgrading to facilitate simultaneous embarkation and disembarkation, improve the passenger experience or enable more boats to dock. In the central area development of these piers should be led by TfL, which should consider the business case for spending £15-30 million pounds upgrading strategic piers to enable a better service. Appropriate maximum docking times for different services should be imposed and enforced once the piers have been upgraded to allow for faster turnaround. 6. New piers should be developed as residential and commercial development occurs – New piers should be a key part of the development of the Thames Gateway and western riverside. Some areas already have sufficient population to justify a pier; some will have in the near future. Private developers should be required to build these in the planning process. 7. Signage to and from piers should be a priority – Many piers are almost invisible. Better signage, comparable to that for Underground stations, should be introduced at and around each pier. 8. There needs to be strategic planning of river services – At present piers and routes develop ad hoc. 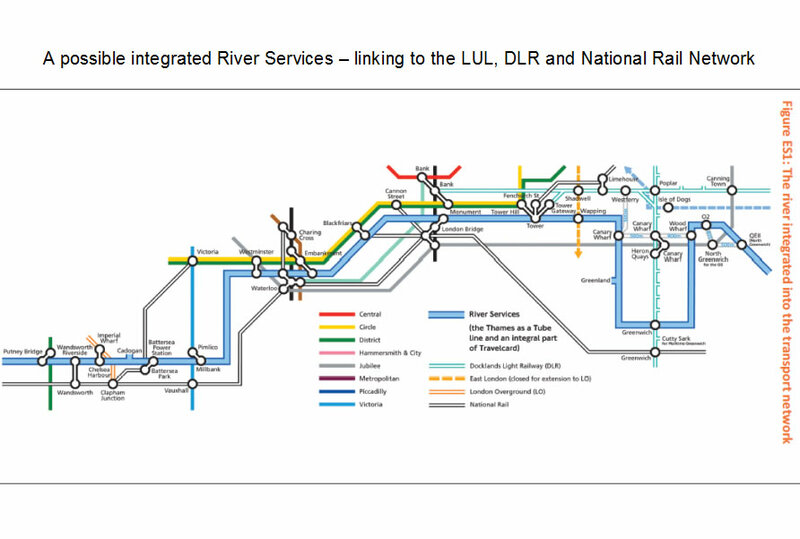 Given the significant growth expected over the coming decades, in particular in Docklands and the Thames Gateway, a more strategic approach to route planning is needed to ensure that the necessary infrastructure, traffic management and management capacity at London River Services (LRS) are in place when needed. 9. 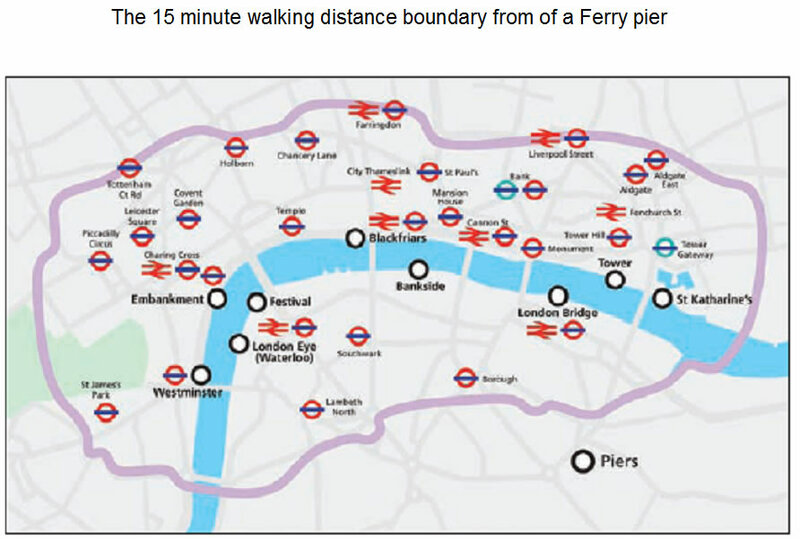 The river service should be designed to be as accessible as possible – Boats and piers are already more accessible for wheelchair users and other people with limited mobility than most London’s public transport network, and this should be explicitly prioritised in the pier upgrade programme. 10. Piers should be designed or upgraded to maximise interchange with other transport modes – In addition to better information and signage, links to bus interchange, cycle parking, public cycle hire and pedestrian routes should be considered. These links should be used to extend the range of the piers to as many homes and places of employment as possible. 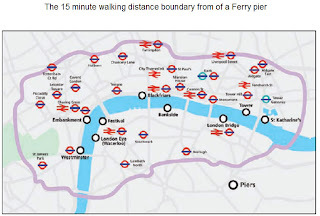 More publicity should be given to the range of destinations in central London which are within a 15-minute walk of pier locations. Park-and-ride options in East London should also be explored. 11. Where necessary the service should be subsidised – Subsidy is one part of the combination of measures needed to expand services. Creative, targeted use of subsidy should be used to help grow river services. The river currently receives significantly less subsidy than other modes of transport in London. TfL should be prepared to use small levels of subsidy to drive better use of the river. 12. The speed limit should be reviewed – The speed limit west of Tower Bridge should be reviewed with the aim, among others, of delivering a viable transport service. Better traffic management, and improved safety techniques and scheduling should all be considered so that faster journey times are possible for commuters in the morning rush hour. A code of practice for leisure users of the river should also be prepared. New boats should be designed to minimise wash, reducing the impact on other river users. 13. Emissions standards of new boats should be raised over time – with expansion of river services (and the refreshment of the fleet) come the possibility of improving environmental performance. By stipulating a rising emissions standard for boats, the service can expand and become greener over time. As Andrew Gilligan points out the chief obstacles to putting in place a river transit system in London tend to be organisational and political. 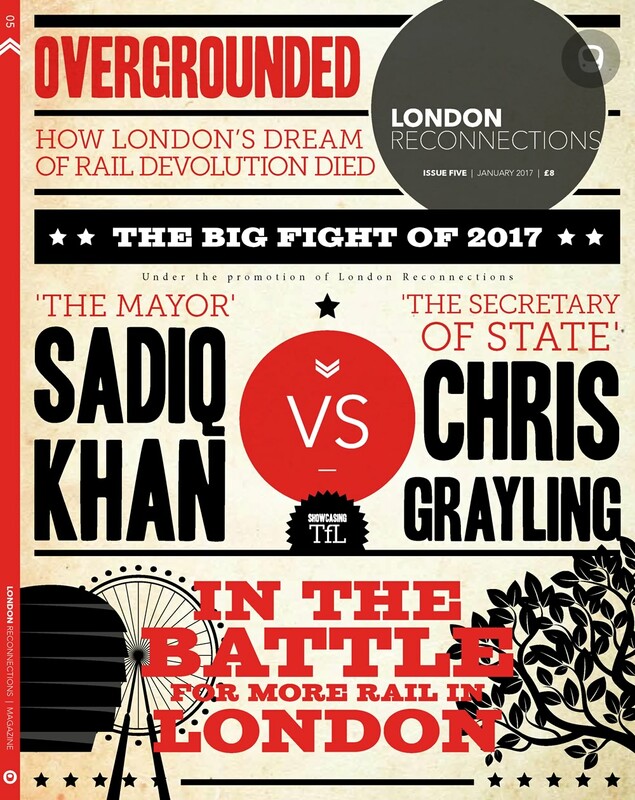 Will the Mayor already fighting, according to certain Sunday newspaper reports, a fierce campaign over Crossrail and the Tube Upgrades want to fight on the mudflats, as well? Up to now he has tended to fend off questions at MQT’s from Jenny Jones about why travel on the Thames cannot be brought into the Oyster Regime. Kulveer Ranger makes an all things to all men holding contribution to the report – like the Mayor he gives the impression of being careful where he puts his feet. The Mayor is undoubtedly treading warily. In addition to wanting a favourable outcome to Crossrail and the PPP aftermath, he is also seeking to revise the devolution settlement for London. The river in general – but not passenger services in particular – features prominently in his proposals for the future devolution of powers to the Mayor. He would like to extend his control to the Port of London Authority and other transport areas. We will be examining these ideas in the near future. Whether central or neighbouring local government will view his proposals in a favourable light remains to be seen. For all candidates however there remains the problem of paying for it however small. One option the Mayor might be consider is to drop the idea of cancelling the WEZ – he cannot after all be outbid on this by his opponents in that both Labour candidates have indicated on Iain Dale’s LBC programme that they would reinstate the congestion charge. In the absence of Crossrail 2, for the foreseeable future, an improved service to the centre of London and Docklands from Putney, Fulham and Chelsea might go some way to sweetening the pill down the Kings Road. One final point. It is possible to have good politics and bad politics together with good economics and bad economics. Good and bad politics can spring from good economics but bad economics always produce in the end bad politics. Good economics and bad politics always prove unsustainable in the long term. Improving the river as a transport artery is good economics that could be really good politics.